reverberate with festivity, as rows of make shift stalls display a bewildering array items. Body tattooing is yet another favorite activity. The profusion of colors that run riot in the desert sand, the glee and the contagious enthusiasm of the village folk are a unique experience for every visitor.and sand dunes on the other, Pushkar forms a fascinating location and a befitting backdrop for the annual religious and cattle fair which is globally famous and attracts thousands of visitors from all parts of the world. One of the most popular and colorful fairs of the Thar desert is the Pushkar fair, which begins on Kartik Shukla Ekadashi & goes on for five days till Kartik Purnima. The time of the fair coincides with the bright half of the moon during the months of October-November. The lake at Pushkar is one of the most sacred in India. This small town is transformed into a spectacular fair ground, as rows of make shift stalls display an entire range of objects of art to daily utility stuff. Decoration items for Cattle, Camel and women, everything is sold together. Fair. Camels, Horses, Donkeys, Bulls, etc are bought, sold, beautified, raced and paraded on the sand. In fact, the fair is predominantly a rural gathering, where villagers from different parts of state comes with their animals and lakes are flooded with the pilgrims for the Holy Dips (SNAN). 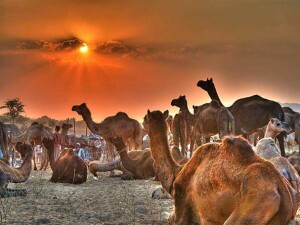 the Pushkar Fair and set up shops. They sell a host of products like bead necklaces of Nagaur, woollen blankets of Merta, textiles printed in Ajmer and Jodhpur, brassware of Jodhpur and Jaipur etc. Also on sale are saddles, ropes, and assorted household items. Vendors peddle their dazzling range of wares at hundreds of roadside stalls. Small groups of men and women can be seen tatooing names and pictures on their hands and other parts of the body.During the fair, cultural shows and exhibitions are organized to enliven the event.